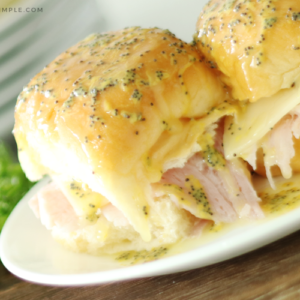 Juicy ham and Swiss cheese inside soft Hawaiian rolls brushed with a buttery topping that's baked and made absolutely delicious! These Ham and Cheese Sliders are perfect for feeding a crowd and could not be any easier to make! Slice rolls in half. Put the bottoms of the rolls face up in a 13x9 casserole pan. Spread mayo on top and bottom of the inside of each roll. Place a slice of cheese and a slice of ham on each roll, then place the tops of the rolls back on top of the sandwiches. Mix together the melted butter, mustard, Worcestershire sauce and poppy seeds in a small bowl. Brush the butter mixture all over the tops of the rolls. Cover with tin foil, or leave uncovered if you want the tops a little crispier. Bake at 350 for 15-20 minutes until the cheese is melted and the meat is heated through.